Hey Guys! I want to start off this post by telling you that the pictures you will see are of ME and MY BODY. I ask for your respect and that you don't post any rude or ugly comments about ME or MY BODY. I know MY BODY is not perfect, I am only putting the pictures here to show you how the Bio-Oil works. Please be respectful. Anyways, on to the main reason we are here. I started using Bio-Oil about a week ago and I wanted to keep you guys up to date on how it was working. I have LOTS of stretch marks on my stomach from carrying Boo, a large scar on my stomach from a surgery incision that got infected, and I have my new surgery incision scars. I really wanted to see if I could get any of these to be less noticeable, so I decided to give Bio-Oil a try. I apply the Bio-Oil two times a day like the directions say. I apply it to my skin and rub it in, in a circular motion for a few seconds. I am only currently applying it to my stomach and my new shoulder surgery incision scars. Here is one of the surgery incision scars (I couldn't get good pictures of the other one by myself). This one is on the front of my right shoulder. 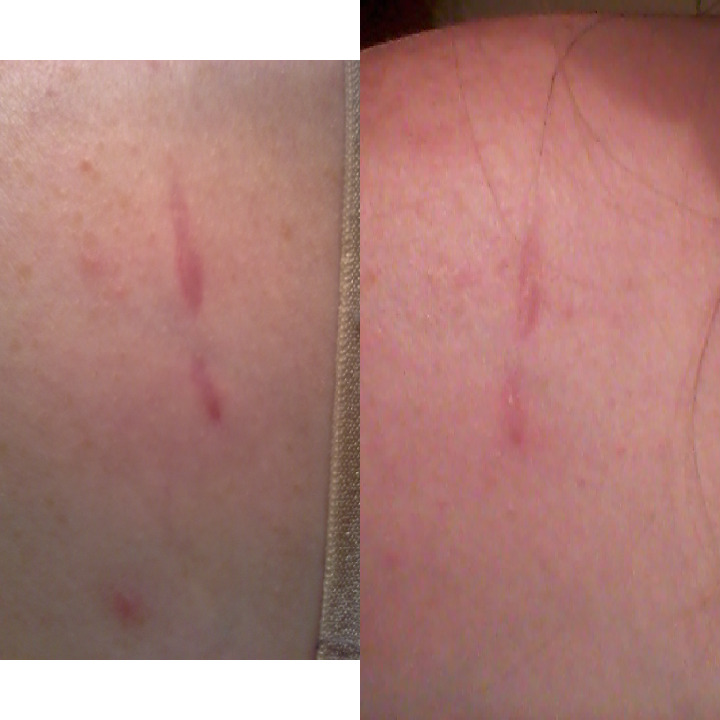 The picture on the left is the before and the one on the right is a week into using the Bio-Oil. If you can tell, the one on the right is already starting to lighten up quite a bit. And as you can probably tell, this is my stomach. All of the stretch marks are from my pregnancy with Boo. And at the bottom middle of my stomach, you can see the large scar from where an incision from my appendectomy got infected. The picture on the top is the before and the one on the bottom is a week into using Bio-Oil. As you can see, the stretch marks and scar are starting to lighten up. Some of the small stretch marks are almost undetectable now. So, at a week into using the Bio-Oil, I am pretty impressed. Also, I feel like I have barely used any of what is in the bottle, so despite feeling like it was a bit expensive, it is lasting a long time. I will be keeping you up to date on how the Bio-Oil is working, either every week or every couple of weeks. Right now though, I am really liking it!